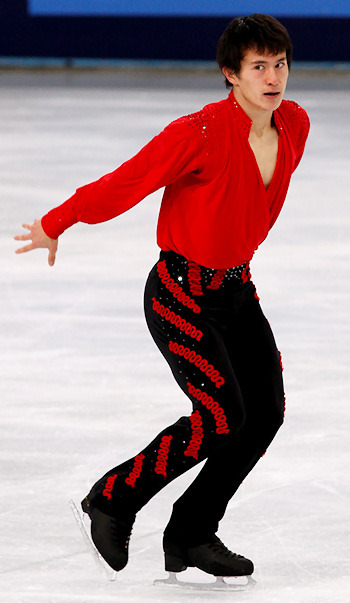 Canada's Patrick Chan performs to "Adagio from Concierto de Aranjuez" by Joaquin Rodrigo. World Champion Patrick Chan of Canada took his third Trophée Bompard title Saturday in Paris. He had won his very first Grand Prix gold medal here in 2007 and defended the title in 2008. China’s Nan Song skated to the silver, his second medal on the Grand Prix this year, while Michal Brezina of the Czech Republic captured the bronze. Chan and Brezina have now booked their tickets to the Grand Prix Final of Figure Skating, while Song’s fate depends on the results in Moscow next week. Chan didn’t have quite the performance he and the audience were looking for. The 20-year-old started off with a quad toe and quad-triple toe, but then ran into trouble when he doubled the Axel and fell in the footwork. He also stumbled on two Lutzes. Still, Chan scored 156.44 point for his Concierto de Aranjuez and defended his overnight lead with a total of 240.60 points. “Overall, I’m pleased with the result and the program is always a joy to skate. I’m happy at the end no matter how many mistakes I’ve made,” concluded Chan. Song’s Hungarian Rhapsody program included two quad toes as well as well as five triple jumps. He only doubled a Lutz and wobbled on a Salchow. The Chinese skater picked up 147.57 points and remained in second place with 224.10 points. Skating to The Untouchables, Brezina decided to go for a quad Salchow, but doubled it. While his two triple Axels and five other triples were good, he tired visibly at the end. He stepped out of a double Axel and slowed down in the last spins. The combination spin was a level one and the change foot sit spin didn’t receive a level. The Czech earned 144.28 points for this effort, and scored a total of 218.60 points. USA’s Adam Rippon attempted the quad Lutz but two-footed the landing and the jump was downgraded. He also later underrotated a triple toe and doubled a Lutz. Despite the mistakes, the 22-year-old nailed both of his triple Axels and three other good triples. His performance to the lyrical Air was well received by the crowd, and he finished fourth at 217.89 points. Florent Amodio of France set out to do better than in the short, however, he crashed on a quad Salchow and singled an Axel. He proved his fighting qualities when he rallied back to hit the triple Axel as the last jump towards the end of his Latin medley. The European Champion remained in fifth place at 201.34 points. Japan’s Nobunari Oda was affected by a knee injury that he aggravated when stumbling on a double flip. He fell three times during his routine, and popped a loop and an Axel. He slipped to seventh with 167.20 points. Kevin Reynolds of Canada suffered from a stomach upset and withdrew after the six-minute warm up.